We have all been tempted by the ninety-nine cent oil filter or the five dollar air filter. They may seem like a good deal, but are they? We spoke with Ruben Crow, Parts Manager at Los Angeles Toyota Dealer Norwalk Toyota. Ruben has been in the Toyota parts business for over 25 years and has seen his share of aftermarket parts failures. "My first experience with an aftermarket part was back in 1985. I was 16 and had just bought my first car, a 1970 Ford Maverick. It wasn't much of a car but to a bright eyed 16 year old boy it meant freedom." Ruben continued "After a month or two my alternator went out and I needed to replace it. So i went to the local auto parts chain to get a rebuilt one for half the price the Ford dealer wanted. It was a simple process. I went home, installed it and i was on my way. I was satisfied knowing I had saved some money and after all my new alternator had a lifetime warranty so I never had to worry about that again...or so I thought." "Not two weeks later I was back at the auto parts store with my alternator. Turns out it needed replacement again. Lucky for me it had a lifetime warranty." "A month later and now late for work on the side of the road with a dead battery I once again realized my alternator had failed. I finally gave up and realized that good deal wasn't such a good deal. All my wasted time and missed work cast more in the long run". "So i borrowed the money from my dad and bought a re-manufactured alternator from the Ford Dealer. That was the last of the problems I had with the alternator. The rest of the car, that's another story..."
"When customers ask me why they should buy a Genuine Toyota parts my answer is simple." "You bought your Toyota because it's a Toyota. Toyota's are known for their dependability. Why would you want to install an inferior part on your vehicle thereby decreasing it's reliability?" 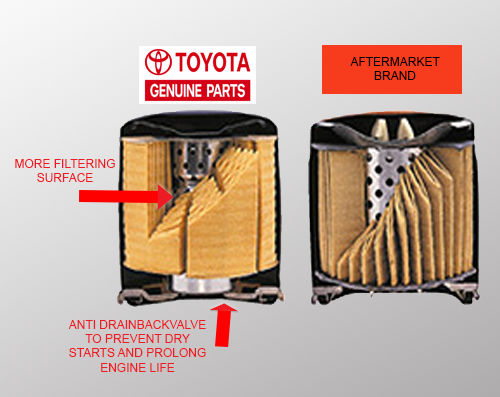 If you buy a $5.00 air filter for your Camry you will lose out on the triple layer protection a Genuine Toyota filter provides. You increase the risk of smaller contaminants entering your engine and causing damage. In most cased Genuine Toyota parts are not much more expensive then the premium replacement parts most auto parts stores offer. "What good is a lifetime warranty if you have to keep spending time replacing the same part over and over again?" Don't risk your investment. Keep your Toyota a Toyota with Genuine OEM Toyota Parts.